Senior Nat Jones’ strong go-getter attitude and breadth of vibrant and unique collegiate experiences has allowed them to leave a great legacy at Florida State University. “FSU has been a great place for me to develop skills in research, leadership, service and figuring out my place in this world,” Jones said. As a Tallahassee native, Jones grew up around Florida State and knew from the get-go that it was the right fit, especially after being accepted into the Presidential Scholarship Program, FSU’s premier undergraduate merit scholarship award. It was being a part of FSU’s prestigious Presidential Scholar program that helped Jones to realize the career path they wanted to take early on. 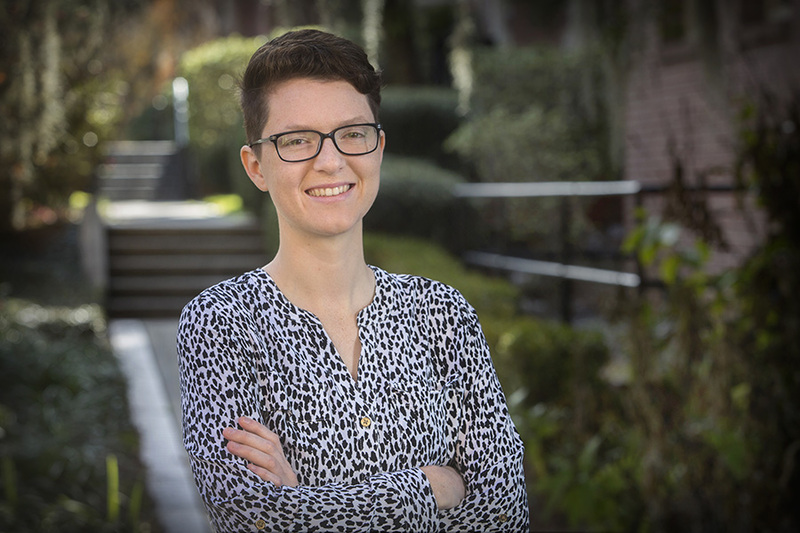 “From my first day at FSU, faculty in the Presidential Scholar’s Program were prompting me to start reflecting on my life experiences to see how I could utilize them for my future goals,” Jones said. Through all that reflection, Jones was able to pinpoint what they wanted to do with their life — pursue a career in transgender medicine. The honor student began the path to medical school as a biology major, but along the way found two other subjects that they loved too much to let go — Japanese and art history. “I have always had a great love for the arts and valued them just as much as STEM,” Jones said. Jones immediately took advantage of FSU’s many research opportunities, doing two Undergraduate Research Opportunity Program research projects as a freshman — one at the MagLab on sodium MRI techniques and the other at the Institute on WWII and the Human Experience on U.S.-Japan post-WWII relations. The research on Japanese culture really caught Jones’ interest, so they began taking classes on the subject to learn more. Eventually, Jones wanted to experience Japan firsthand and was selected as one of 23 students in the nation to receive the Critical Language Scholarship in 2016, allowing them to spend two months studying abroad in Japan. Intrigued by a Shiga War Shrine in Japan, Jones decided to write an honor’s thesis in art history on the subject, which they defended in fall 2017. Recently, Jones has been conducting research in the lab of professor Yanchang Wang at the FSU College of Medicine. “In addition to the strenuous preparation Nat has put into becoming a doctor, they have also dedicated a significant amount of time in my lab over the past three years studying the regulation of chromosome segregation, a biological process related to cancer development,” Wang said. Jones is also a trailblazer on campus in leadership and service — seeing a need and jumping into action. One of Jones’ most impressive accomplishments came at the end of their freshman year when their partner was diagnosed with a bone marrow failure disease. Rather than waiting on the sidelines for a potential match, Jones established a local chapter of Be the Match on FSU campus and signed more than 2,000 individuals to the national bone marrow registry. In its first year, the Be the Match FSU was recognized as was the number one college chapter in the entire country, matching at least four people across the world and saving their lives. This year, Jones has served as the president of the Art History Association, coordinating events with the Art History department, and also works with Pride Student Union on programs to strengthen the FSU LGBTQ community, such as the Transgender Closet, which helps members of the transgender community find clothes that fit them. Jones is making their mission a reality, spending this past summer designing clinical research in the Pre-Health Undergraduate Program at the University of California, San Francisco, preparing for a career in transgender medicine. “The biggest thing that I learned was that there is hardly any research on the long-term effects of transgender therapies and treatments,” Jones said. This knowledge gap fueled Jones’s desire to pursue research in the field. Jones also wants to help deconstruct gender binaries in medicine and work towards a greater understanding of what is best for transgender patients. In addition to research, campus activism and studying abroad, Jones has made the dean’s and president’s lists, is in the Phi Beta Kappa Honor’s Society and was selected a nominee for sought-after scholarship programs like the Harry S. Truman Scholarship, the Marshall Scholarship, the Fulbright Scholar Program and the Rhodes Scholarship. “Even though I wasn’t chosen, the application process was a great learning experience that allowed for even more self-reflection and focus on my career path,” Jones said. The advice that Jones’ gives as part of the key to their success is don’t wait to get involved on campus. “You’re here, you’re at FSU, and there are so many things that you can do,” Jones said. After graduation this spring, Jones plans to attend medical school and become a physician-researcher specifically in the field of transgender health.